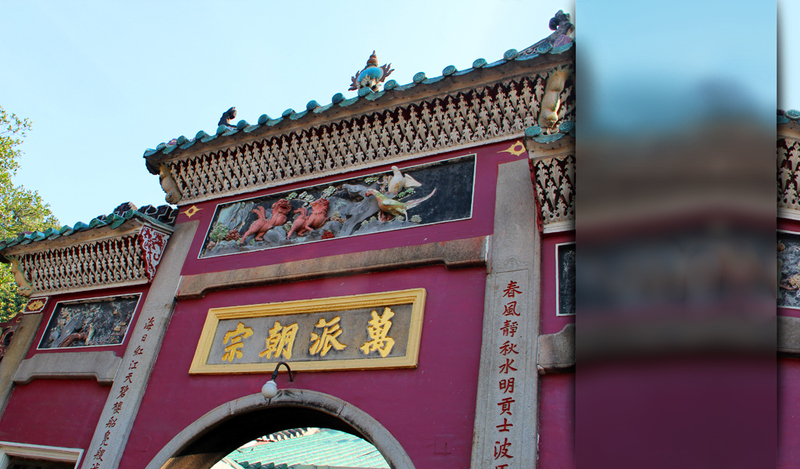 Macau's name is derived from A-Ma-Gau or Place of A-Ma and this temple dedicated to the seafarers' goddess dates from the early 16th century. According to legend, A-Ma, a poor girl looking for passage to Canton, was refused by the wealthy junk owners but a lowly fisherman took her on board. A storm blew up and wrecked all but the boat carrying the girl. On arrival in Macau she vanished, to reappear as a goddess, on the spot where the fishermen built her temple. Three of the four pavilions are dedicated to A-Ma and contain some fine statues of the goddess together with a model of a junk with cannons, brass vessels and chapels to Buddhist and Taoist gods. The top shrine honours Kun Iam. This temple is distinguished by beautiful tiled roofs and spectacular views from the upper gardens. The festival of A-Ma takes place on the 23rd day of the 3rd moon (April or May). Firecrackers, to scare away evil spirits, are exploded in the entrance courtyard to greet tour groups and lions dances are performed here on weekends.